(Nanowerk News) In work that someday may lead to the development of novel types of nanoscale electronic devices, an interdisciplinary team of researchers at the California Institute of Technology (Caltech) has combined DNA's talent for self-assembly with the remarkable electronic properties of carbon nanotubes, thereby suggesting a solution to the long-standing problem of organizing carbon nanotubes into nanoscale electronic circuits. A paper about the work appeared November 8 in the early online edition of Nature Nanotechnology. "This project is one of those great 'Where else but at Caltech?' stories," says Erik Winfree, associate professor of computer science, computation and neural systems, and bioengineering at Caltech, and one of four faculty members supervising the project. 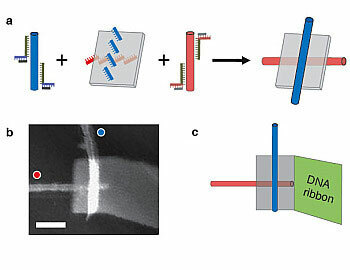 Rothemund's work gave Maune, Han, and Barish the idea to use DNA origami to build carbon nanotube circuits. DNA origami is a type of self-assembled structure made from DNA that can be programmed to form nearly limitless shapes and patterns (such as smiley faces or maps of the Western Hemisphere or even electrical diagrams). Exploiting the sequence-recognition properties of DNA base paring, DNA origami are created from a long single strand of viral DNA and a mixture of different short synthetic DNA strands that bind to and "staple" the viral DNA into the desired shape, typically about 100 nanometers (nm) on a side. Underlying the students' excitement was the hope that DNA origami could be used as 100 nm by 100 nm molecular breadboards?construction bases for prototyping electronic circuits?on which researchers could build sophisticated devices simply by designing the sequences in the origami so that specific nanotubes would attach in preassigned positions. "This collaborative research project is evidence of how we at Caltech select the top students in science and engineering and place them in an environment where their creativity and imagination can thrive," says Ares Rosakis, chair of the Division of Engineering and Applied Science at Caltech and Theodore von K?rm?n Professor of Aeronautics and Professor of Mechanical Engineering. Bringing the students' ideas to fruition wasn't easy. "Carbon nanotube chemistry is notoriously difficult and messy?the things are entirely carbon, after all, so it's extremely difficult to make a reaction happen at one chosen carbon atom and not at all the others," Winfree explains. "It worked," Winfree says. "I can't say perfectly?there's lots of room for improvement. But it was sufficient to demonstrate the controlled construction of a simple device, a cross-junction of a pair of carbon nanotubes."